At this time of year I see such pretty lights and decorations all around and I feel like I want to add some sparkle to my home! I love Christmas balls, they are festive and pretty and I think would look great in a bowl or hanging in my home. (When I lived in Belgium we often hung green apple Christmas balls as they are a sign of hope in winter). With this said, would this be considered avodah zara (involvement with another religion)? Of course no Christmas tree involved! What are your thoughts? I would say that this time of year is one of the greatest challenges to our Judaism, and especially that of our children. The astounding allure of the sound and light show taking place in every mall and store, all the glitter and catchy Christmas carols (many of which were written by Jewish composers!) fill the air and, inadvertently, our heads, make it beyond difficult not to be swept up in the dazzle of it all. The streets of our neighborhoods feel like airport runways with all the lights glittering on many homes. (My favorite was one house and yard lit up with so many lights flashing and twinkling that it could rival Times Square; the house next door had a small lit up sign with an arrow pointing toward their next door neighbor which simply said “ditto”). It is quite clear that if we try to match what they do, we don’t stand a chance! If we try to add the dazzle into our holiday, our modest Hanukkah lights ‘don’t hold a candle’ to their mega-watt light show. The way we need to go is not to try to outdo them, or worse, to join in their celebration by allowing their celebratory items to enter our homes during this time. We rather should show our families that we’re comfortable saying that our neighbor’s decorations are very beautiful, but we have something deeper. This will challenge all of us to search more deeply into our tradition and understand what Hanukkah truly represents and how it profoundly affects our lives. We need to understand what the battle with the Greeks was truly about; what was it about our belief system that they were challenging? We should contemplate just how the Macabees succeeded, despite the overwhelming odds, to defeat the most powerful army in the world. We must understand why the Temple was worth fighting for; why there was such a great celebration for getting it back. What was really so important about some oil burning longer than it should have; is that the celebration or was it the battle? If the main miracle was the battle, why do we celebrate with candles and not with a Seder telling the story of the war with the Greeks? If we could acquire, through study and learning, a deeper understanding of what we’re doing in our Jewish homes during this time, we will be able to pass on to our children the strength of Jewish character needed to retain their Jewish pride during a time when it seems, by all that surrounds us that our belief system is second-fiddle to the system of our hosts. Many wonderful websites exist today in which, by the click of a mouse, you can greatly enhance your understanding of Hanukkah. Check out, as one example, aish.com. By all accounts, the core of the battle between the Macabees and the Greeks was about assimilation. The Syrian-Greeks sought to impose their Hellenistic culture upon the vanquished Jews, rendering their Torah and observances obsolete and coaxing them to melt into Greek society. Unlike other conquerors, the Greeks saw no need to physically destroy the Temple; they had no problem with it standing like some sort of museum of the Jewish past (sadly, like many old synagogues in Europe today). They defiled its holiness then let it stand. They had no problem with Jews, as long as they were “Greek Jews” with no observances or walls separating them from their hosts. The Macabees saw this as an existential danger to Jewish survival and were willing to fight to the death for this. The miracle of the oil showed that their battle conquest was miraculous. The oil was the illustration of their success. When you mix oil in water, after a while the oil separates and rises to the top. When we remain loyal to our Torah, its light represented by the menorah, even when disbursed among the nations we are able to stay together and rise to the top! To decorate our houses with our neighbors beautiful balls and tinsel would run quite contrary to this message. The miracle of Hanukkah shows that, although we may be fully integrated and successful players in our society, we still retain our separateness. We need to beautify our homes, not with lights and holly, but with the timeless messages of our past, which accompany us into the future. What does Hanukkah mean to you? A very long time ago, the King of Syria, Antiochus, took charge of Israel. He wanted everyone to be like him, so he told the Jewish people that they could no longer do Jewish things. No more studying Torah, no more celebrating Shabbat, no more praying to God. Antiochus and his army came in and ruined the Jewish Temple in Jerusalem. This made Judah Maccabee and his family and friends very angry. They fought back against mean Antiochus and his army. It took a long time, but with some clever moves and help from God, Judah Maccabee’s little army defeated Antiochus’ large army. Judah and the Maccabees went straight away to the Temple to start cleaning it up. When it was all clean, they wanted to light the Ner Tamid, the Eternal Light, to rededicate the Temple. They could only find one small bottle of holy oil, enough to last one day. It would take many days to make more holy oil. They poured the little bottle of oil in the Ner Tamid and a miracle happened! The oil burned for eight days, which was enough time to make more oil and keep the light burning. They decided to celebrate the miracle that had happened every year, so they declared a holiday — Hanukkah! The story above is what we tell children — the Maccabees are heroes. They were heroes but in a different way. Judah and the Maccabees were part of the Hashmon Dynasty, a priestly family who were out of power. They were angry at the priests in power because they were trying to live Greek lives — become assimilated Jews. The Maccabees were actually fundamentalists and wanted all Jews to practice Judaism in the “proper” way. The warring began as Jew against Jew. To control things, the Syrians and Antiochus tried to impose a neutral religion on Palestine. They forbade circumcision, Shabbat and Torah study and imposed idol worship. It started as one thing but then truly became a fight for religious freedom. The story of the Maccabees is in the book called the “Apocrypha,” not a Jewish book. The rabbis wanted to eliminate the story of Hanukkah but all they could do was keep it out of the Jewish books. The Talmud contains a very short passage about the temple and the holy oil — the story of the miracle. No matter which story you use (or have heard) the question comes down to — what does this mean to us today? What are the messages that we take from them both for our children and for ourselves as we hear the possibly more disturbing side of the story? Is it better to just know the children’s version? For our children and grandchildren, let us keep alive all the wonderful parts of the story. However, this year take some time to Google the real story of Hanukkah and challenge yourselves to find the message that works for you. Sorry — I give you no answers — just more questions. Hanukkah! It’s here. And now’s the time to get your latke on. Fried and succulent with a hint of onion and generously dolloped with sour cream and fresh applesauce. If you must have other foods, make … another type of latke! My version below with beets, carrots and parsnips is crazy colorful and so modern. Try my applesauce. It couldn’t be easier and you’ll never buy the jarred stuff again. Still need more? Try my salad — fattoush with chickpeas. And, if you must have a bit of protein, add some chicken the mix. Hanukkah sameach! Take a classic cold salad, add some grilled or roasted chicken and high-protein chickpeas and you have a cool and filling entrée salad. Cut pitas in half and pry open the pockets (or tear the halves apart). Place the pitas on a baking sheet and toast until golden, about 10 minutes. Remove from oven and cool completely. Break up into 1-inch pieces. Just before serving, combine salad ingredients, EXCEPT PITA, in a large bowl and toss well. Quickly whisk together the dressing ingredients and pour over the salad. Add the pita and toss well. Serve immediately. Makes 4 entrée servings. Make latkes: Coarsely grate potatoes by hand (with a box grater) or in the food processor and let them sit until they turn reddish-brown, about 30 minutes. Drain the potatoes in a strainer and rinse well with cold water until the potatoes are white again. If the strands of potato are too long (as sometimes happens with a food processor), chop them slightly. In a large bowl, combine the potatoes, onions, eggs, flour, salt and pepper. Mix and let stand for 10 minutes before frying. In a large skillet, heat 1/8 inch of oil until very hot but not smoking. Make a test pancake by dropping a heaping tablespoon of the potato mixture into the skillet. Using a spoon or spatula, form the mixture into a circle shape. Don’t worry if your pancake is not a perfect circle. Cook 3 minutes or so on each side until the pancakes are golden and cooked through. NOTE: As latke batter sits, it becomes more “watery.” Stir each time before you use the batter. Drain the latke well on paper towels or on flattened, paper grocery bags placed over baking sheets. Taste for seasoning, adjust salt and pepper and make the latkes until the potato mixture is gone. If you must add more oil, do it when the skillet it empty, never pour new oil onto cooking latkes, it makes them greasy. Serve with lots of applesauce or sour cream. Makes 8 servings. Combine the vegetables, eggs, breadcrumbs, salt and pepper in a large bowl and stir well. Heat oil in a skillet and fry until golden and crispy on both sides. In a large skillet, heat 1/8-inch of oil until very hot but not smoking. Make a test pancake by dropping a heaping tablespoon of the vegetable mixture into the skillet. Using a spoon or spatula, form the mixture into a circle shape. Don’t worry if your pancake is not a perfect circle. Cook 3 minutes or so on each side until the pancakes are colored and cooked through. NOTE: As latke batter sits, it becomes more “watery.” Stir each time before you use the batter and add more breadcrumbs if needed. Drain the latke well on paper towels or on flattened, paper grocery bags placed over baking sheets. Repeat with remaining batter. If you must add more oil, do it when the skillet it empty, never pour new oil onto cooking latkes, it makes them greasy. Serve with sour cream. Makes 8 servings. Easy enough to make all the time and far superior to the commercial stuff. If I keep the skin on, the applesauce is pinkish. Place all ingredients in a microwave-safe bowl. Cover with plastic wrap and cook on high for 10 minutes. Stir with a fork and mash slightly. Cover again and cook in 5-minute increments until the apples are quite soft. Allow to cool slightly before placing the mixture in the bowl of a food processor or blender. Process until smooth, but still a bit lumpy if you like. Serve the applesauce warm or chilled. Makes about 4 cups of applesauce. Even though my children are more than “grown up,” they never cease to amaze me. I have taken the liberty of writing about the four of them in other articles — so perhaps you have a sense of whom they are and what they may be like. I have great rachmones for oldest children. “In the olden days” we were supposed to be the example setters and possibly even pieces of clay for our parents to shape and form. By using my own parenting tools, I learned that children have the ability to shape themselves — given the correct guidance and parameters — and by following their dreams. Amy Doty is the eldest of my four offspring. She was a tiny little girl, who spoke at 6 months (yes, the word was “light,” and her personality is all about that). She was speaking in coherent sentences and walking by the time she was 9 months old. She had a smile that would light up a room, and a giggle that was so unmistakably hers that she was nicknamed “Princess Gigglehead” by a preschool teacher. Amy also had a mischievous streak — as the eldest of Reuben, Jordana and Ethan. I never forced them to get along — they just did — knowing that the alternative was kissing and making up — Yuck! Who wants to kiss your brothers? Amy loved to sing and dance and would often accompany her father on some of his singing gigs. I’m telling you, the girl had rhythm. One of her favorite things to do was to play “beauty shop” with her great-grandmother, the late Betty Wisch. Nana would visit our home, and Amy would examine her fingernails and say, “Nana, it’s time for a manicure.” Amy would get a warm bowl of soapy water placed on a clean towel, and set her utensils close by. It was a great bonding time for the two — and Amy was not yet a teenager. The payment would be 1 million kisses and a 25-cent tip. Both were happy with the arrangement. My late grandmother was very vain, and always had a lipstick and tweezers at the ready so that Amy could complete the process. Perhaps some small seeds were planted then. In addition to Amy’s beauty skills, by the age of 10 or 12, she was also a veteran TJP telemarketer — as most of the Wisch kids were. She sold New Year greetings and subscriptions in both Dallas and Fort Worth. A few more seeds were planted. 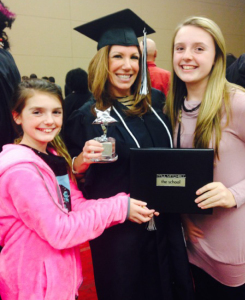 Amy attended Akiba Academy for eight years, and then went on to Westwood Jr. High and Pearce High School. At Pearce, she decided to participate in their work-study program — and was placed at TGI Fridays and a retail store in the old Prestonwood Mall. I thought that all Jewish girls should work retail, and not the restaurant business; however, I was not surprised as she made her way up the Friday’s corporate ladder — opening new stores and traveling the United States as a corporate trainer. Following her decade at Fridays, she managed A+ Student Staffing and later managed The Visiting Angels office in Dallas. She also was a top-notch advertising salesperson for The TJP and knew the mantra instilled in us by my late father — “Tell ‘em and sell ‘em.” — and she did. Following my father’s death in 2002, Amy left her full-time position at Visiting Angels to join my mom, Sharon and Reuben full time at The TJP. It was easy to see that those small seeds planted so long ago bloomed into the beginning of a flowering career in public relations and advertising. 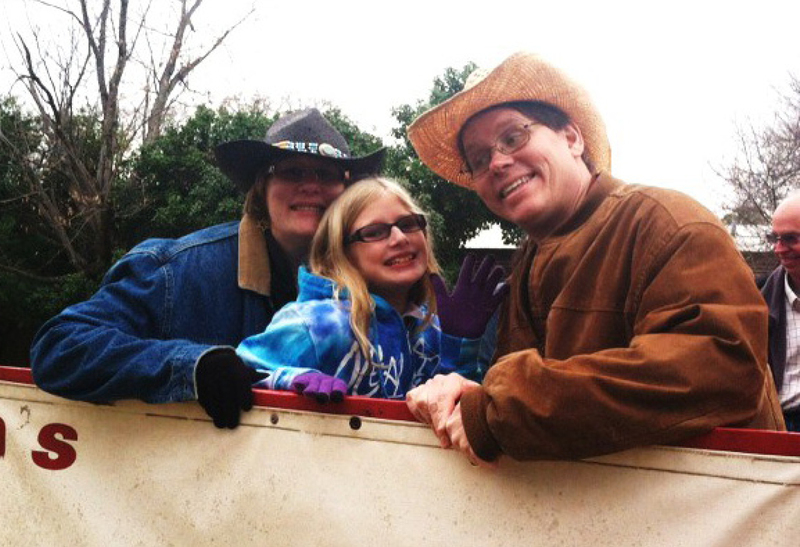 Amy, a single mom of two daughters, Shea, 13, and Jessica, 11, is indefatigable. The “beauty seeds” flowered again, and she flourished as an independent hair and make up artist for portraits, bridal events and parties. I’ve often heard the quote that is paraphrased here “if you want something done, give it to a busy person.” This would exemplify Amy, who did it all — but, wait, there’s a bit more. Amy Doty and her daughters Jessie, left, and Shea. Amy made a decision to add to her portfolio and return to school at night. She chose the Esthetics program at Paul Mitchell, The School. Following a grueling 750 hours of evening course work, Amy graduated last week and received the school’s Extra Mile Award in addition to her certification in facial treatments, waxing, makeup and machine facials such as microdermabrasion, ultrasound, LED, microcurrent and chemical peels. According to Kayla Anderson, Amy’s lead instructor at the school, a spa management program is available for anyone wishing to apply. “Amy applied for the spa manager position and of course, I gave it to her right away. She was the perfect fit! As spa manager, she was in charge of the nightly appointment schedule, informing the ladies of any challenges they may need to work on and celebrating any victories they may have had! She planned class parties for different occasions. She was also in charge of the class pow-wows that were meetings we (sic) held before we took clients in order to plan for the evening. So, in conclusion, her responsibilities as spa manager were tremendous. Congratulations, Amy. I am so proud of you and I love you. You have set a wonderful standard for your daughters to follow. Hanukkah festivities are underway in Fort Worth and its surrounds. Last weekend Congregation Beth Israel held its Annual Hanukkah Hoedown at Newton’s Rocky Top Ranch. Beth Israel has a Hanukkah potluck dinner and service planned for Wednesday, Dec. 17. Dinner (bring a vegetarian dish) is at 6 p.m. with a BYOM (bring your own menorah) lighting at 7 p.m.
Beth-El Congregation will host two Hanukkah events this weekend. To kickoff the weekend, at 6:30 p.m., Friday, Dec. 12, you can BYOM and candles and light the lights together, eat dinner and enjoy the Men of Reform Judaism’s famous latkes; listen to the musical talents of the new Children’s Choir; and for the grand finale, be dazzled and amazed as magician Bo Gerard (www.bogerard.com) demonstrates what the magic of Hanukkah truly looks like. The event is free, but donations are accepted and appreciated. RSVPs to the synagogue office, 817-332-7141 are required. Fun at Beth-El will continue for those with young families at a Hanukkah party at 11:30 a.m., Saturday, Dec. 13 at Pump it Up, 1500 Mall Circle in Fort Worth. The event is free for Beth-El families with children age 7 and under (siblings are welcome). Again, the event is free, but donations are accepted. An RSVP to the synagogue office, 817-332-7141, required. On Sunday, Dec. 14, Chabad of Arlington will host a menorah making workshop from 11 a.m. to 1:30 p.m. at the Home Depot, 201 W. Road to Six Flags in Arlington. The supplies and fun are free, but an RSVP by is a must to participate. Call Chabad at 817-933-2877 and let them know that you and your family will attend. There is more exciting news for Chabad of Arlington and the Mid Cities — they have a new home. The address is 1861 Brown Blvd., #213, Arlington 76006. The community is invited to attend the dedication of the Chabad House at a Hanukkah celebration at 8 p.m., Saturday, Dec. 20. Enjoy wine, music and sushi. RSVP to rishi@arlingtonchabad.org or 817-933-2877. Chabad of Fort Worth will hold its community Hanukkah celebration at 7:30 p.m., Sunday, Dec. 21, at the Chabad Center, 5659 Woodway Drive. Rabbi Dov and Chana Tova Mandel would love to see you there. If you are in Arlington and the Mid Cities Dec. 20, and Chabad of Arlington isn’t your scene, you can attend the Hanukkah party at Congregation Beth Shalom, 1212 Thannisch Drive. The fun starts after Shabbat at 6:30 p.m. Finally, if you are not in the Mid-Cities and want to stay closer to Cowtown Dec. 20, Ahavath Sholom (4050 S. Hulen St.) will host a communitywide Hanukkah celebration from 6:30 to 9 p.m. The Ahavath Sholom children’s choir will provide entertainment. Please bring a can of food or two to be donated to the Arbor Lawn Food Pantry. As they say that’s a Hanukkah wrap! The holiday season offers a chance for people from many different backgrounds and faith traditions to give back to the community. It’s a time for people to reflect on the good things in their lives and share with others. The question for those who would help is often not whether to volunteer, but where? More than 8,000 people have created accounts on the Volunteer Center’s Voly.org website. The site’s cutting-edge technology is similar to popular social media sites. Users can search by cause, location, date or by the name of the agency they wish to serve. Hundreds of volunteer opportunities are available on Voly.org every day. The Volunteer Center of North Texas helps to connect more than 25,000 volunteers every year with more than 2,500 local nonprofits. The available opportunities range from food banks and homeless services to animal shelters and arts providers and everything in between. Many agencies provide services year-round — including holidays. Some agencies still have available volunteer opportunities for the days when a lot of people are spending time with family and friends. 2. Language is a method of communicating concepts. It would be a higher form of power to simply create things from ideas instead of taking the extra step of turning those concepts into language. I’m assuming here that the language would be used in some transcendental fashion since God has no mouth, and it physically wouldn’t make sense for the words to actually be spoken. I mean, I get that there were 10 utterances, (as the Mishnah states that over the 6 days of creation God spoke 10 times), but to say that it was in Hebrew instead of some divine mechanism that transcends human language doesn’t really make sense. Your assumption is that the language God spoke is God’s method of creation, not part of the creation itself. I would like to suggest that we consider looking at God’s words in a different light. The word for “speech” in Hebrew is “dibur.” The word for “object” or “thing,” is “davar.” The root of both words is the same, dalet, beit, reish. Scholars of the Hebrew language teach that whenever two words have the same root, conceptually there is a common denominator between those two words. This would not seem to hold true in our example of speech and objects. They seem to be two completely different concepts with no common denominator at all! Why, then, do they share the same root?! The Kabbalists explain that this common root reveals the hidden meaning of both a word and an object. We learn from this that the word actually is the object! We see from this that the “speech” of God is not merely the mode of creation, it is the essence of the creation itself! There’s another level of understanding which further elucidates this lesson that the word is the object. What I mean is that by the same token that the word is the object, the object is the word. What does this mean? As we mentioned above, God willed an object into existence before creating the word. Each object God willed should be created was for a purpose; it is supposed to, in some way, exhibit the will of God in the world. The mission of that object is to forever “speak” the message of that will of God through which it was created. The object continues to be a “word” which eternally “speaks” that message by its very existence. The word is the object and the object is the word! That’s precisely why it would not be a higher form of power to create the objects directly, as you asked. That would usurp the purpose of the creation and rob it of its purpose: to forever speak the message of God! This concept is borne out further in the first task assigned to the first man, to ascribe names to all the animals. A name in Hebrew is its “sheim,” spelled the same as the word “shom,” which means “over there” in Hebrew. Again, what is the common denominator? The answer is that its name, which is the word which created it, is it’s “over there,” the deeper meaning hidden beyond the shell that meets the eye. The first man was able to delve into the purpose of the creation of each animal and, from there, to trace it back to name, the speech that God utilized in the creation of that animal. For Richard Schindler, Dallux Motors is not his first spin around the car dealer block. It is however, a change from the traditional model of car sales. The longtime tin man spent more than two decades with Goodson Auto Group. First as a salesman and then as the sales manager and general manager of Goodson Acura in Dallas and then president of Audi Dallas and The Goodson Group. 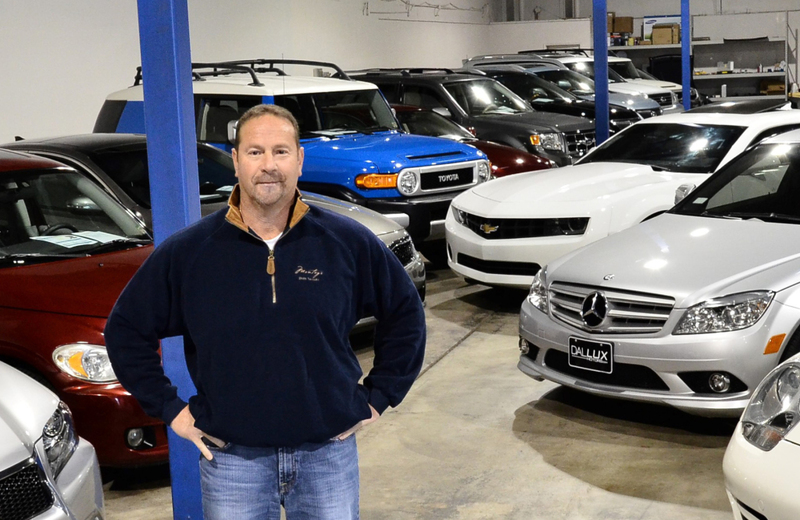 In July, Schindler along with his longtime colleague Kevin Patterson, opened a boutique firm with an extensive inventory of pristine, pre-owned vehicles. Dallux allows Schindler to do what he does best: offer a superlative, customer-service oriented, pain-free buying experience. It’s something he’s been doing his entire career and built a reputation. One of the best examples of Schindler’s menschkite is the story of a wife who wanted surprise to her husband with a new Acura RL for Christmas. Schindler, who was the GM of Goodson Acura at the time, not only facilitated the process, but also posed as a FedEx delivery man and drove the car to the folks’ house at the appointed time on Christmas Day. He rang the doorbell and delivered the keys. This is Richard Schindler at his best, delivering a stellar product in his warm and engaging manner, with unparalleled customer service. At Dallux, Schindler and Patterson are bringing only the best in pre-owned to the Dallas market. Many of these cars come from auctions in Florida or Arizona. They are typically low mileage, one-owner vehicles that have never been exposed to the harsher climates of the north especially the corrosive materials from the icy roads. Schindler and Patterson research the vehicles extensively before going to auction, making sure that the vehicles haven’t been in accidents or had other damage that sometimes doesn’t pop on its Carfax report. Once back in Dallas, the cars are put through an intense inspection and cleaned to like-new perfection. The Dallux showroom is literally gleaming with about 30 cars at all times. Like any car dealership, you can trade in your car, sell it for cash and obtain financing all at one stop. Recently, Schindler answered some specific questions about Dallux Motors. TJP: Most of your career you have spent working for large dealerships. What are your favorite things about starting Dallux motors? RS: We have the ability to find specific cars for our clients whereas at the big stores, you really have to stock more general inventory and hope that it fits for the masses. This allows a much more personal custom approach. TJP: What are you most proud of at Dallux Motors? RS: In the first six months of operations, between Cars.com, Facebook, yelp and Google, we have earned over 30 perfect 5 Star reviews. And we are also seeing referrals from our new client base. TJP: What is the advantage of Dallux Motors? Can’t I find a good pre-owned car myself online? RS: Maybe. Not everything is as it appears. Carfax and such catch about 70 percent of damage reported on cars. They miss millions of damaged autos. Also, many companies are self-insured (Hertz, Enterprise, etc.) so they don’t have to report any damage and perform their own repairs. If you don’t know all the signs of what to look for, you could be buying someone else’s problem. We take the guess work out because if after our scrutiny we find we did buy a car with an issue, we either fix it properly or we wholesale it and will not retail it. TJP: There seem to be a lot of incentives on new cars out there. What’s the advantage of buying pre-owned? RS: Incentives are great but the adage is, “if it’s new then lease it.” If you want to purchase, then purchase pre-owned and let the first guy take the hit. Regardless of the incentive the heaviest drop is the initial one. TJP: What do you recommend for a first car or a car for younger drivers? Can you get that for me? RS: That is what we specialize in. Finding that safe, serviced, credible first car. We usually stock and recommend a four door sedan that is 2 to 5 years old depending on budget. It works out for insurance, for helping out mom and dad with siblings and they usually offer better visibility than coupes. TJP: If you don’t have something on your showroom floor, how long does it take you to find what I’m looking for? RS: It depends on the request. To find a Honda Accord could only take 10 days or so. To find a white BMW 6 series convertible with red leather interior could take weeks. It really depends, but we would let you know our best estimation at the time of consultation so there is no misunderstanding and we keep the clients updated. When not at work, Schindler loves spending time with his wife Laura, and their children, Benjamin, a sophomore at University of Georgia; Sydnie, a senior at Greenhill and Mitchell, a freshman at Greenhill. The Schindlers are members of Congregation Anshai Torah and active in the Jewish community. To reach Schindler, contact him at 972-807-6300, rschindler@dalluxmotors.com or www.dalluxmotors.com. Hanukkah is more than a children’s holiday — it has an amazing story. Did you know the Maccabees were zealots? Did you know the fight began as one of Jew against Jew? Did you know that the real fear was not physical extermination but spiritual annihilation? The message to us is one of standing up for our beliefs because we know what we believe and we are proud of who we are. Let us teach our children to know who they are through our learning and understanding. The current challenges and issues in our country demonstrate the importance of this. Hanukkah has many wonderful rituals, and families continue to create new traditions to teach the special messages that are part of the historical event — a wonderful opportunity. What are the messages we want our children to understand? Despite pressure to conform, Mattathias and his five sons refused to bow down to idols. Being a Maccabee, whether long ago or today, means fighting for the right to be different and being proud of those differences. We also teach our children that being small does not mean being insignificant. The Jewish people have always been small in number, but we have always been strong in spirit. We know that each of us can make a difference in the world. And this is the legacy of the Maccabees and the celebration of Hanukkah! Cover the tables so the children can paint murals, make figures out of clay, make a new chanukkiah for the season and more. Invite friends who like to play instruments and sing and have a songfest with a little karaoke (and maybe a talent show). Do something for others — buy a gift to donate, go to a home for the elderly, collect food and deliver to a shelter. The gift for the night is a book for each person followed by reading and storytelling. A night for a big family night, or if you live far from family this is the night to call everyone on the phone. Watch a movie together — pick one that can be a family favorite for years to come (and, of course, make popcorn). The gift for the night is tickets to a cultural event that everyone in the family can attend. Definitely the favorite — make presents for each member of the family or draw lots to make one for a special person. As this year ends, I’m remembering several remarkable Jews who left us for good in 2014, leaving behind them many and varied accomplishments. Last week I talked about Alice Kober, who provided the key to understanding an ancient language. Today I honor Nadine Gordimer, a fearless activist for social equality in South Africa, and the first ever of her native country to win the Nobel Prize for Literature, when it was said of her that “through her magnificent epic writing, she has — in the words of Alfred Nobel — been of very great benefit to humanity.” She was 90 when she died in July of this year. Was it because of her Jewish background that Gordimer identified so closely with the oppressed blacks of her country in their fight against apartheid? Her father, the only one in the Gordimer family who actively practiced Judaism, came to the Johannesburg area as a refugee from tsarist Russia, where he had known unequal treatment firsthand, but was never a social activist. Her mother, born to an assimilated Jewish family in London, actively fought discrimination, but religious Judaism was virtually nonexistent in her personal life. Nadine, who never graduated from college, was the product of Catholic school education. She identified herself as “a Jew by birth,” but her personal “religion” was atheistic Communism. Writing began early for Gordimer. She was 15 when her work first appeared in a South African children’s magazine; only a year later her adult fiction began to find publication. In 1951, she became known to United States readers when the New Yorker published one of her stories, beginning a long relationship with that magazine. Although Nadine produced some book-length works, she preferred short stories, which she called “the literary form for our age.” Her first book was actually a collection of her early short pieces. She remembered a time in her childhood when police raided her family’s home to search the belongings of a black servant, but it was the arrest of a friend in 1960 that pulled Nadine Gordimer into anti-apartheid politics. She became a close friend of Nelson Mandela, helped him by editing his speeches and was one of the first people he asked to see after his release from prison in 1990. For years, her own writing was censored and some of it totally banned in South Africa. One of her books was even removed from school reading lists. We can all relate to this today, with the recent Highland Park high school flap over books some parents think are too mature for their teenage children, plus the current controversy about proposed content of U.S. history books up for formal adoption for use in all Texas schools. The Gordimer-removal action occurred in 1991, the same year she achieved international recognition with the awarding of the Nobel Prize. Nadine Gordimer was acclaimed for fiction that melded the themes of love, politics and tensions in a racially divided country. Her very first published novel, 1953’s “The Lying Days,” is a thinly veiled autobiography; it recounts a young white woman’s growing awareness of what she finds unacceptable in her own hometown. I’m especially thinking of Gordimer today as our own country comes face-to-face with the unresolved political and racial tensions seen most pointedly in Missouri, Cleveland and New York City, bringing us all to the inescapable truth that we have not at all cohered in that great “melting pot” dream of earlier America. Perhaps some fine writers (perhaps Jewish?) will come forth here and now to take on the task of making these problems understandable through fiction. I remember that William Lederer and Eugene Burdick first wrote their esteemed 1958 book “The Ugly American” as a document of political reality, but converted it to novel form when they faced this vital truth — as did Nadine Gordimer: people as a whole can often handle troubling truths more easily when they are fictionalized. On Monday, Dec. 8, the Knesset, Israel’s single-house parliament, unanimously passed legislation to self-dissolve, and hold national elections March 17, 2015. That does not mean that Israel is without a government. The outgoing cabinet continues to function with full executive powers and authority as an “interim” government until April or May, when the newly elected Knesset is sworn in and seated, so that it can pass a vote of confidence in the new government, which is then sworn in and starts functioning immediately. National: The entire country constitutes a single electoral constituency. Direct: The Knesset, the Israeli parliament, is elected directly by the voters, not through a body of electors. Proportional: The 120 Knesset seats are assigned in proportion to each party’s percentage of the total national vote. Knesset elections are based on a vote for a party rather than for individuals. Prior to the elections, each party presents its platform and a list of candidates to the Election Committee. A list deposited with the Committee is “carved in stone” and cannot be changed or revised until the next election. Parties seated in the outgoing Knesset can automatically stand for re-election. Other parties can present their candidacy after getting signatures of 2,500 eligible voters and depositing a bond, which is refunded only if they succeed in winning at least one Knesset seat. Knesset seats are assigned in proportion to each party’s percentage of the total national vote. So if, say, a party gets 20 percent of the total amount of legal votes cast in that election, then it will be allocated 20 percent of the seats (24). The number and order of members entering the new Knesset for each party corresponds exactly to its list of candidates deposited for that election. There are no by-elections in Israel. If an Knesset member resigns or dies during the term, then the next person on that party’s list automatically replaces him/her. Election Day in Israel is an official holiday so that everyone can participate. Soldiers on active duty vote in special polling stations in their units. Special arrangements are made for prison inmates to vote, as well as for those confined to hospitals. Israeli law does not provide for absentee ballots, and voting takes place only on Israeli soil. The only exceptions are Israeli citizens serving on Israeli ships (both navy and civilian) and in Israeli embassies and consulates abroad. As soon as the votes are tallied and confirmed by the Election Committee, the new Knesset is sworn in and begins to function. This creates an interesting situation because the “old” Interim government is still in place and running the country. Following consultations with the new Knesset factions, the president gives one Knesset member, who seems to have the support of at least 61 members, the responsibility of forming a government. This “Prime Minister designate” now has 28 days to present to the Knesset a list of ministers for approval, together with an outline of proposed government guidelines. All the ministers must be Israeli citizens and residents of Israel; they don’t have to be Knesset members, but most usually are. To date, all governments have been based on coalitions of several parties, as no party since 1949 has received the minimum of 61 Knesset seats to be able to form a government by itself. As you can see — in Israel — unlike in the U.S., the prime minister’s government draws its power and authority from the Knesset, which is elected by the people. A week ago I was convinced that Bibi Netanyahu was a lock to continue as prime minister after this election. Today, with all the shameless deal making, political ship-jumping, backstabbing and foreign “intervention,” I’m not so sure, not so sure at all. I guess we’ll have to wait until after the elections. Agree or disagree that’s my opinion. Lt. Col. (IDF res) Gil Elan is President and CEO of the Southwest Jewish Congress, and a Middle East analyst. Email: gil@swjc.org. Upcoming briefings and SWJC events are listed at: www.swjc.org. DISCLAIMER: Opinions are the writer’s, and do not represent SWJC directors, officers or members.